Keystone Compliance is a full-service regulatory compliance laboratory offering solutions for nearly all EMC/EMI, environmental, ISTA-certified package and ingress protection testing requirements. Keystone prides itself on being the engineer’s laboratory due to our focus on the four main points of a lab; staff, facility, equipment and location. Staff. 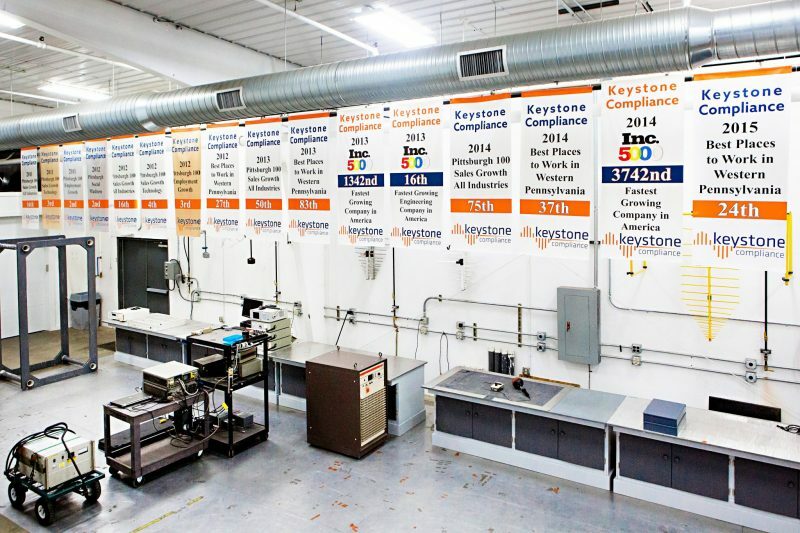 Keystone Compliance is an accredited laboratory with a staff of engineers and report writers with the technical expertise to meet testing requirements with thoroughness, accuracy and efficiency. The staff at Keystone focuses on proactive communication with the customer. Our engineers understand the importance of providing technical feedback and detailed reports with quick turnaround times. Facility. Customer comfort is a priority of Keystone Compliance. The facility is a 30,00 sq. ft. building located on a four-acre campus. The lab space is brightly lit, temperature controlled and features a spacious customer lounge with individual workstations, WIFI and numerous other amenities. Equipment. Our EMC/EMI lab features five test chambers, including three anechoic/ferrite lined 3-meter chambers. Our environmental lab includes three electrodynamic shakers, multiple walk-in temperature/humidity chambers, a number of reach-in temperature/humidity chambers and a variety of other environmental test equipment. Location. Keystone Compliance is conveniently located between Pittsburgh and Cleveland with easy access from a variety of interstates. Our lab is located in a business district with a number of restaurants and retailers in close proximity, and a new three-star hotel approximately two miles away.